Good morning, Heartdweller Family. Clare received a message yesterday from the Lord, given specifically to our young people, and she asked me to share that with you all today. She began: My precious young people, youth is a very difficult time to balance, because hormones are taking over in your body and causing you to be unstable emotionally, and not able to think clearly. When everyone seems to be against you, remember: God is FOR you. Your first reaction is to fly off the handle and start complaining and pointing the finger, saying just how unjust so and so is. But God has a better way. Jesus began, "May I say, you are in the flesh? I have covered you. I will infuse you with knowledge and wisdom beyond your years if you will get ahold of yourselves, calm down, and then seek My Face. Seek My wisdom. I have given you a Bible full of wisdom. I have given you a Bible Promises filled with wisdom. Yet still you prefer to get worked up, flex your muscles and get upset, angry, insecure--even desperate. "No, My precious ones. You mustn't act this way! When you are troubled and threatened, number one, cry out to Me, 'Jesus! Save Me!' And then sit and wait quietly, pray from your heart, pour out your fears and hurts. I am here to listen to all. I knew this sucker punch was coming, way before it hit you in the head. Now I want to guide you out of your confusion, anxiety, and thoughtless reactions. "I have the remedy, and it is in My Word if you will actively seek it. Do you think it is a coincidence when I open a Bible to a certain page for you to read? Do you think My arm is so short I cannot descend from Heaven and make your fingers move to the right page? How silly of you to have so little trust in Me. "The first thing I want to do when you are hurt is say, 'Come here, Son. Come, Daughter. Let Me hold you.' The second thing is to make you feel My Peace and My extreme love for you. The third thing I want to do is show you the way out. My Word is a light onto your feet and a torch unto your path. 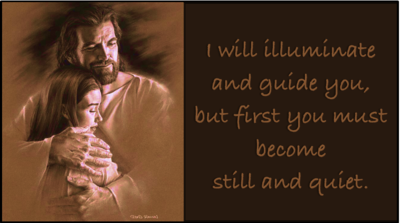 I will illuminate and guide you, but first you must become still and quiet. Let Me help you sort it out. "Don't you know, I have plenty of experience with unexpected sucker punches? When the synagogue leaders tried to throw Me over the brow of my own town of Nazareth. When the Pharisees accused and questioned Me in the Temple. When I stood before Pilate. When I received 40 lashes. When I climbed Calvary... Don't you know that in those moments I, too, was facing the explosive anger of My enemies? And I, too, was being taunted and reviled? "But I did not react. I sought the heart of My Father, and spoke what He wanted Me to speak--not what My flesh may have wanted to do or say. "So, if I can navigate those things, surely I can help you navigate your challenges and tests of faith. So please, My young adults, please. When you are deeply hurt, stop and listen for My voice. Reach out for My arms. I will quiet your soul and speak to your heart, even through the Scriptures. "When they revile you, they revile Me. When they throw stones at you, they hit Me. I stand beside you and bleed when you are being injured. I partake of your suffering, and I guide you in the way you should go. A way in which, someday, all will be ratified before the Tribunal of God, and you will be glorified with the glory My Father gave Me. "You are My sons and daughters. Therefore, you must reflect Me. Stop. Come to Me. Let me hold and guide you. Then you can wipe the blood and spittle off My face, even as I have wiped it from yours. "I love you so very deeply. It grieves Me to see injustice. And once more, those who cast stones unfortunately should be the ones upon which the stones are heaped, because their sins are not invisible to Me. I know each one, and they that condemn are those who should be condemned. "Yet I did not come into the world to condemn it, but to save it. "Forgive and release all bitterness. Then take My hand and walk with Me." And that was the end of the Lord's message. But I would add to you, too, Heartdwellers this morning. We have been working a very long time it seems, on a book on Healing that we've written. Compiled from the messages on the Channel. We've titled it When God Heals, and When He Doesn't. Now, it is still NOT available for physical sale on Amazon or anywhere We've come against roadblock over roadblock for that. We are trying very hard to work it out! But we HAVE made it available to you as a PDF from our Heartdwellers.org website. You can look for it there, right on the front page--Mike has it posted. And you can feel free, please, to download it and read it from there. There's a link, if you click on it, it'll take you right to the PDF, and you can download it then. With the Lord's help, I know, we are still going to get the way cleared to publish it physically, and when that happens, we'll let you all know. But this is something we can offer to you in the meantime.